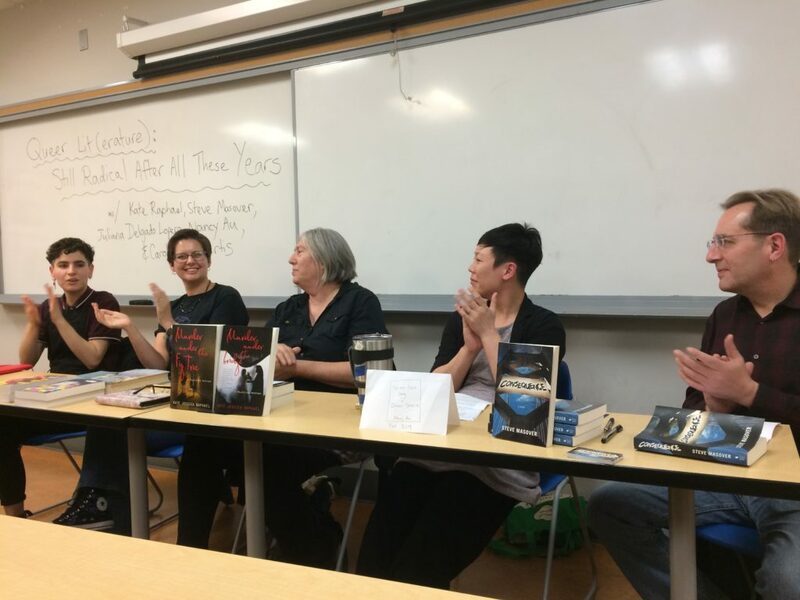 2 December 2018: LGBTQ Lit(erature): Still Radical After All These Years at the 5th annual Howard Zinn Book Fair, held at San Francisco City College’s Mission Campus, 1125 Valencia St., 4-5:30 (the HZBF runs 10-6). Fifty years after Stonewall, a generation of queer writers and readers comes of age trailing a legacy of history, literature, and busted-open closets. For many of today’s U.S. queers, the coming out story, HIV/AIDS narrative, triumph over bullying tale, or gay love story feel insufficient to fully reflect our lives, yet curators of mainstream queer culture continue to lean toward those archaic motifs (think “Carol” or “Simon”). How are today’s queer fiction writers bringing our perspective on gender and sexuality to stories rooted in broader struggles–immigration, colonization, racial justice, climate change, and social upheaval? How are we pushing for our place in spaces where queers remain unwelcome? How do we create stories “queer enough” for the gatekeepers of a niche market without isolating ourselves from broader readership? What kinds of stories will speak to and challenge LGBTQ youth just beginning to define themselves? Join Carolina De Robertis, Kate Raphael, Nancy Au, Juliana Delgado Lopera, and Steve Masover in exploring these questions. The theme of this year’s Howard Zinn Book Fair is “Fighting for the Air We Breathe.” RSVP on Facebook (or just show up!). 19 Nov 2017: Narrating the Anthropocene. a panel discussion featuring fiction and non-fiction authors exploring the role storytelling plays in rousing humanity to engage with the crises of our current century. 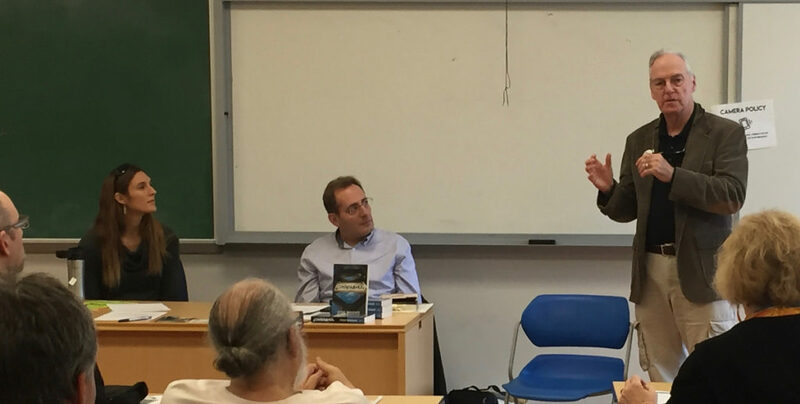 Including Steve Masover with fellow authors Liz Carlisle (Lentil Underground), Michael J. Fitzgerald (The Fracking War) and Jean Tepperman (Warning from my Future Self) at the 4th annual Howard Zinn Book Fair, held at San Francisco City College’s Mission Campus. 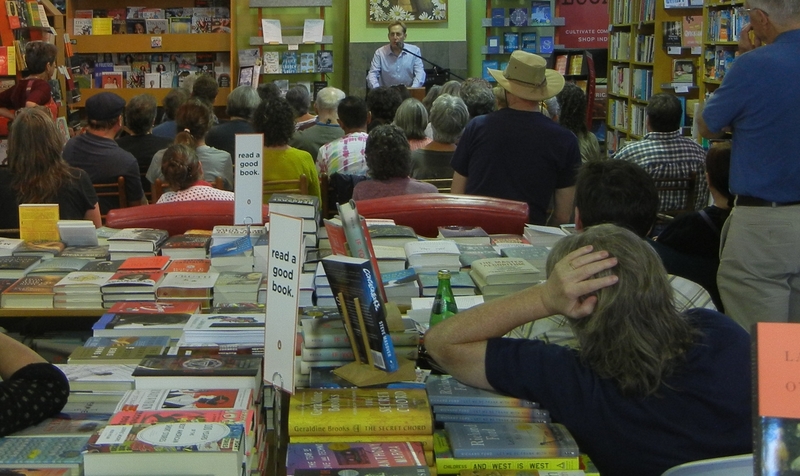 Narrating The Anthropocene panel at the Howard Zinn Book Fair, 19 Nov 2017. From left to right: Liz Carlisle, Steve Masover, Michael J. Fitzgerald (not pictured: Jean Tepperman). Photo credit: Sylvia Fox. 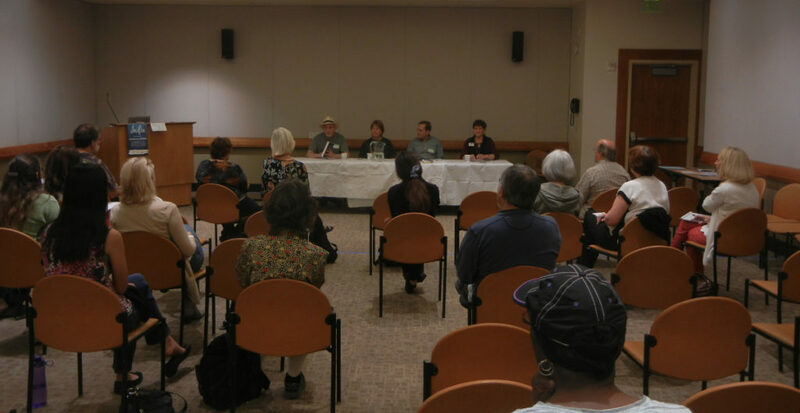 8 Oct 2016: Indie Author Day at 300 libraries across the U.S., including a panel of local authors and editors (Steve is the panelist sitting third from the left in the photo) and a round of “speed reading” at the Berkeley Public Library (Central Branch). 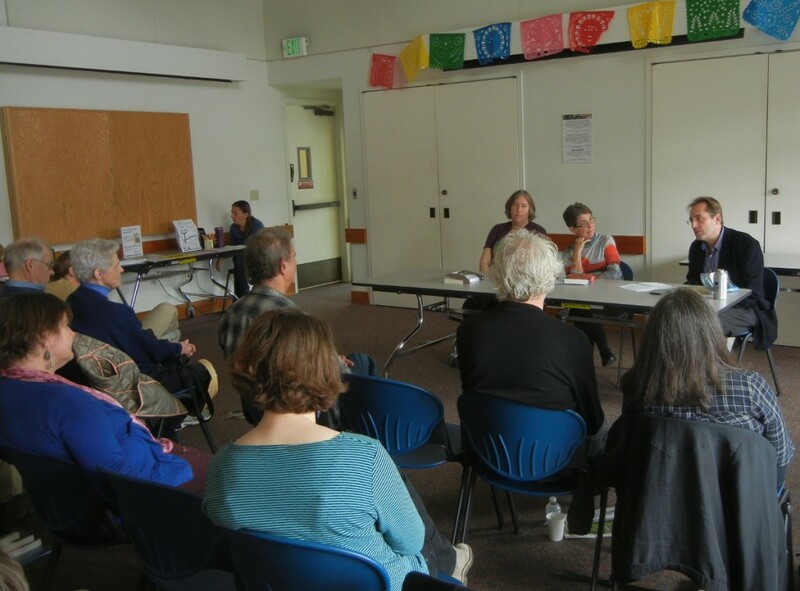 20 Feb 2016: Radical Fiction – Authors Exploring Activism, a panel discussion with Steve Masover, Kate Raphael, and Barbara Rhine at the Oakland Public Library (Rockridge Branch).